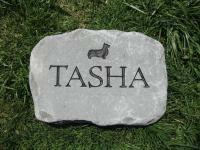 Pet Memorial Stones -Adirondack Stone Works-Free Shipping! 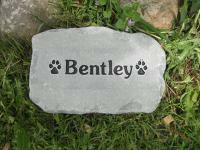 Here at Adirondack Stone Works, we craft natural bluestone pet memorials and pet grave markers. We are not a reseller of stones. We make everything that we sell. This is why we are able to make our stones so affordable and are able to get them to you so fast, in about a week from when you place your order. 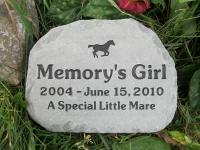 Although we do mostly dog memorial stones and cat memorials, in the past we've done memorials for rabbits, horses, chickens, donkeys, hamsters and ferrets. going to make sure everyone I know that is a pet owner knows about you guys. put into your work is truly amazing. I received the stones for my beloved cats today and would like to tell you how happy I am. The quality of material is undeniable and your craftsmanship is exceptional. Blake's custom paw prints make me smile. I am very grateful for the extra time and effort you spent to make this happen. I could sense your professionalism and integrity through your emails. This whole experience with you has been a pleasure and these stones give me a sense of peace and serenity at this very difficult time. Thank you very much. Just wanted to send you a note of appreciation for the stone I ordered from your company. We made the tough decision to let our baby, Jesse, go last Tuesday. It was one of the hardest decision we've had to make. We buried her Tuesday, and on Tuesday evening I was on the web looking for a grave marker for her resting place on our property. I came across your website, and was happy with what I saw. Ordered one of your large stones with all my specifications. The process was easy, self-explanatory, and quick. I received the stone on Saturday! I couldn't believe how quick I received it, and how wonderful it looked. Thank you so much for your wonderful service to your customers! We love the stone, and are sure you will have future customers, as my extended family was impressed with your quality, and quickness. Just wanted to say I got the three markers today and they are beautiful. The pictures do not do them justice. Thank You, Thank You. 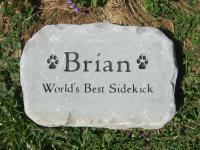 Having gone through two prior cats passing away, I'd bought pet memorial stones from one of your competitors. They were more money than you and I don't think the quality of their stones can match yours. I still have four cats left and when the time comes, I plan on ordering more stones from your company. Thanks for a great looking product and for a great job packaging it up nice and safely in the shipping box. 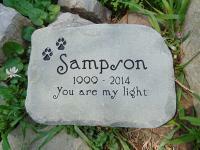 We received our two pet memorial stones yesterday. 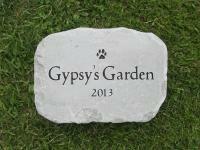 As sad as we were to order these stones, we were extremely pleased with the prompt order processing and delivery. Above all the quality and appearance of the stones is just beautiful. It’s a pleasure to deal with a company that takes pride in their product and I just wanted to express my appreciation. We now have two beautiful reminders of our cherished family pets. Thank-you. 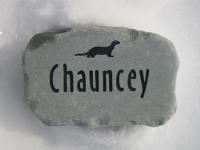 I just received my order for a pet grave marker. It was so nice, I cried. I know that "Our Pup" would like it also. I want to thank you for a beautiful product and the fast delivery time. what we wanted and needed. Thank you for doing what you do so well. 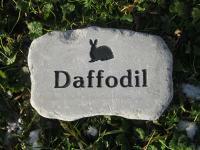 You can expect to receive your stone in about a week from the time you place your order. I received the stones today and they are perfect. Thank-you for your excellent and speedy work. I have ordered several of these from you over the years and I have been very pleased. 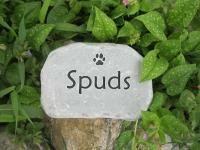 They all go into our pet memorial garden and look very natural with the landscaping. I am a veterinarian and I have recommended your stones to my staff and clients. 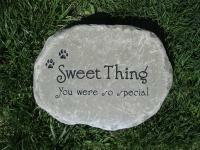 I received the pet memorial stone for Beau, Lady, BJ, Tuxedo, Cooper and Meowser today!... I really appreciate your help and guidance on making the stone exactly what we had hoped for. 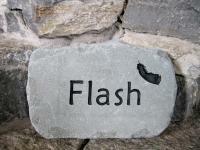 I am also very pleased with the quality of the stone itself...certainly not a lightweight! 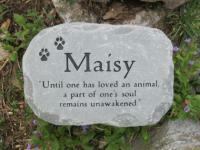 I would not hesitate to recommend you to anyone who is looking for a lasting memorial for their pet[s].